Unique Assembly & Decorating provides rigid substrate printing and product decorating services for industrial & commercial applications and has been working with TopSpot since 2014. As someone who utilizes both SEO and PPC, Unique Assembly & Decorating was assigned to one of TopSpot’s Customer Relationship Teams (or CRTs for short). These teams consist of a Team Lead, 2 SEO Specialists, a Conversion Improvement Specialist and a PPC Account Manager. Unique Assembly’s CRT utilized analytics data to craft an integrated strategy that would improve the quality of the organic traffic and targeted leads the website was receiving. The data-driven strategies below resulted in a 93% increase in phone calls and a 104% increase in the average number of online leads the service provider was receiving on a monthly basis. Using historical search query data from their converting pay per click keywords and landing page data from Google Search Console, the team identified new focus keywords for Unique Assembly’s website. By focusing on search phrases that had a history of driving quality leads, the team found that those in need of custom printing services or applications led to better leads for Unique Assembly’s business. The website’s current content was adjusted throughout the site to drive traffic that better targeted custom jobs. Search query data also revealed that users were searching by material, but not always converting when landing on the site’s material pages, so a custom form was added to all material pages to help users easily submit a form without having to navigate to another page. The form automatically fills in the material from the menu title making it easier for the user to fill out. Additional material pages were created for Unique Assembly’s top printing services and photo galleries were added to showcase their printing capabilities. “Material Types” content was also added to relevant pages to quickly relay what pad printing services they provided. For example, the Pad Printing on Metals page has specific content listing the common types of metal Unique Assembly typically prints on. While pages speaking to surfaces that can be printed on (for example pad printing on glass) were already on the site, a significant number of users were also searching by specific applications or end-products (pad printing on wine bottles, for example). New application focused content was written, optimized photo galleries were added and industry-specific testimonials were included on the new landing pages. Another pattern found within their search query data showed a large number of search queries with location-based modifiers. Users were searching for pad & screen printing based off of their location, more specifically, the city they were in. While Unique Assembly is headquartered in Illinois, it can service companies throughout the United States, but that wasn’t necessarily being conveyed within their content. This provided a clear and personalized experience for each user, while conveying their printing capabilities regardless of their location. The Geo IP tool (demonstrated below) was implemented on the Printing Services, Decorating Services, Industries Served, Materials and Surface Solutions pages as well as the Pad Printing, Screen Printing and Digital Inkjet Printing Pages. The search results page was another area of opportunity identified by the TopSpot team. After reviewing the past year’s internal site search data, the team found that users were typing in the part that they wanted to print on versus the material or shape of the item. The internal site search’s “No Results” page was updated to guide the user to one of the materials pages instead of them leaving from a no search results page (shown below). Unique Assembly’s strategy recommendations were completed within a 7-month period with the goal of improving the quality of organic traffic to the site and increasing the number of targeted leads generated by the website (from both forms and phone calls). The results below are taken from a 22 month time period to show the continued growth associated with the ongoing SEO & SEM strategies. Throughout the first five months shown below, organic traffic was driving on average, 225 sessions to the site per month. In the months following the updates (Months 13-22), the website was receiving an average of 934 organic sessions on a monthly basis. This is over three times the original average. Looking at the same date ranges, form submissions went from averaging 28 goal completions per month, to averaging 57 goal completions per month. When looking at form submissions for the same time frames, Unique Assembly saw a 148% increase in form submissions coming from organic traffic (32 vs. 13) and a 98% increase in form submissions from their pay per click program (12 vs. 6). 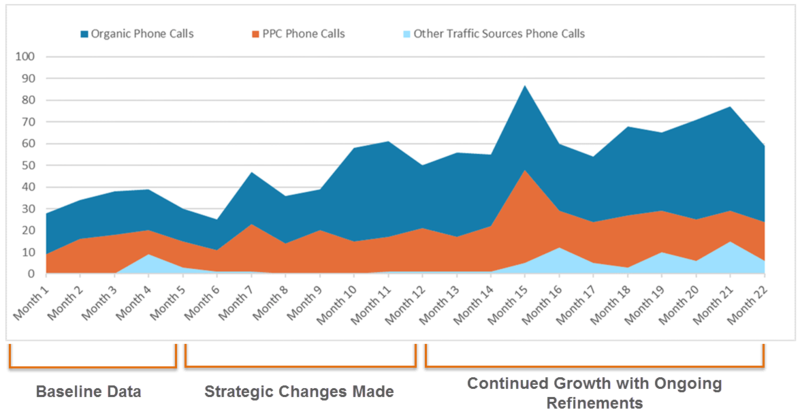 Phone calls driven from website traffic (and tracked via TopSpot’s website call tracking solution) saw a 93% increase when comparing the average number of phone calls that came in throughout the first five months (34) to the average number of phone calls that came in throughout months 13-22 (65). Additionally, since updating the search results page with a custom message, the percentage of search exits decreased by 21.81% (16.18% vs. 20.69%). Unique Assembly & Decorating has also had to make a few changes within their business to accommodate the substantial increase in leads. Over the last few months, they have had to hire additional staff and build out additional office space to accommodate the increase in sales. Interested in learning more about how our team can create a digital strategy fit to your business goals? Whether you are a service provider, a wholesale distributor, or a small business, we can craft an integrated SEM & SEO strategy for your business! Get in touch!